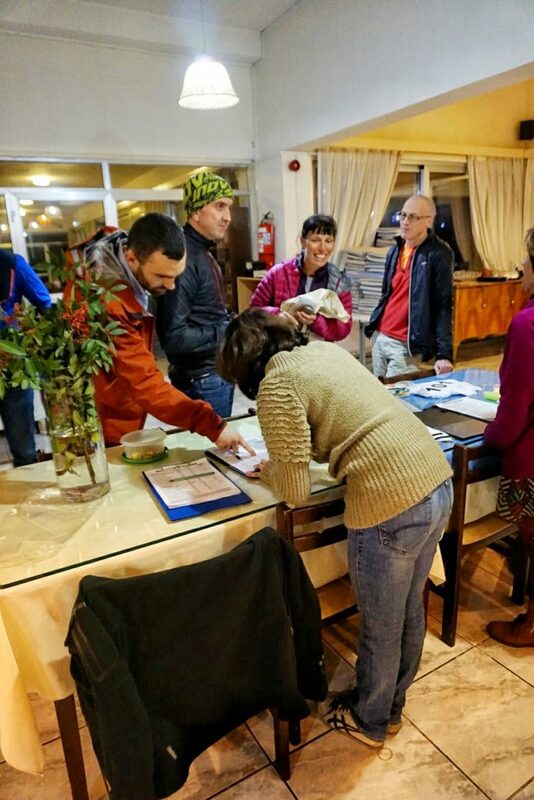 The race began at 6am on Sunday, February 18, 2018. 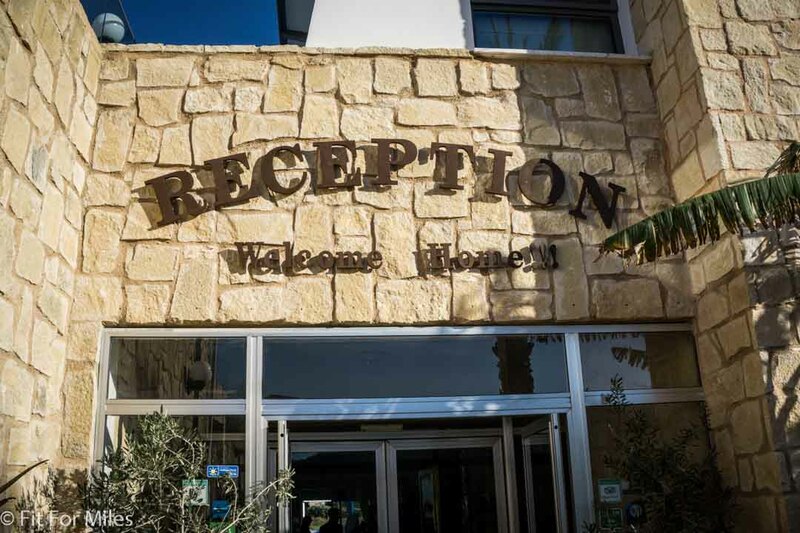 Because the location is quite far from where most people in Cyprus live, a majority of participants stayed at the Aphrodite Beach Hotel the night before (myself included). 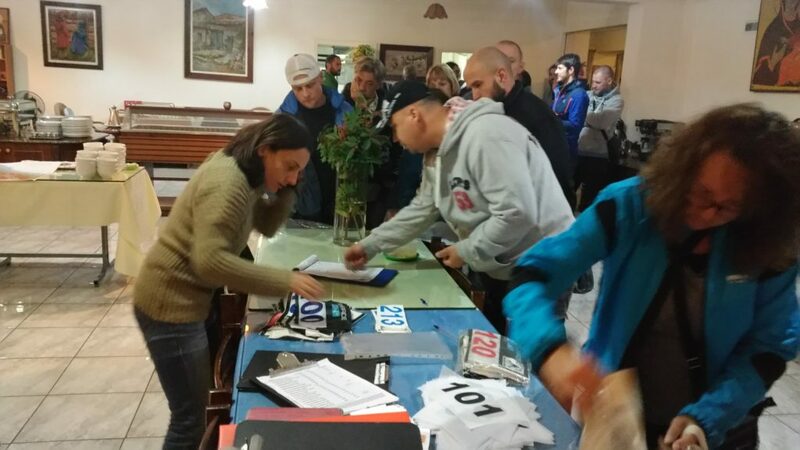 The hotel is also where registration took place from 6-8pm on Saturday. We arrived just as registration was starting and were able to check into our room and drop our stuff off before heading back down to the lobby to pick up our race materials. The hotel itself is basic, but perfect for our needs. Compared to the Troodos Hotel (where we stayed for the Buff Troodos Ultra and Garmin Troodos Mountain Marathon, this place was far better. The rooms were simple and they seemed a bit understaffed (it’s low season, after all), but at least the WiFi worked! We paid 65€/night for a room with free breakfast, which was a nice deal. The line at registration was quite extensive – longer than I have seen at any prior race – which is indicative of its popularity. 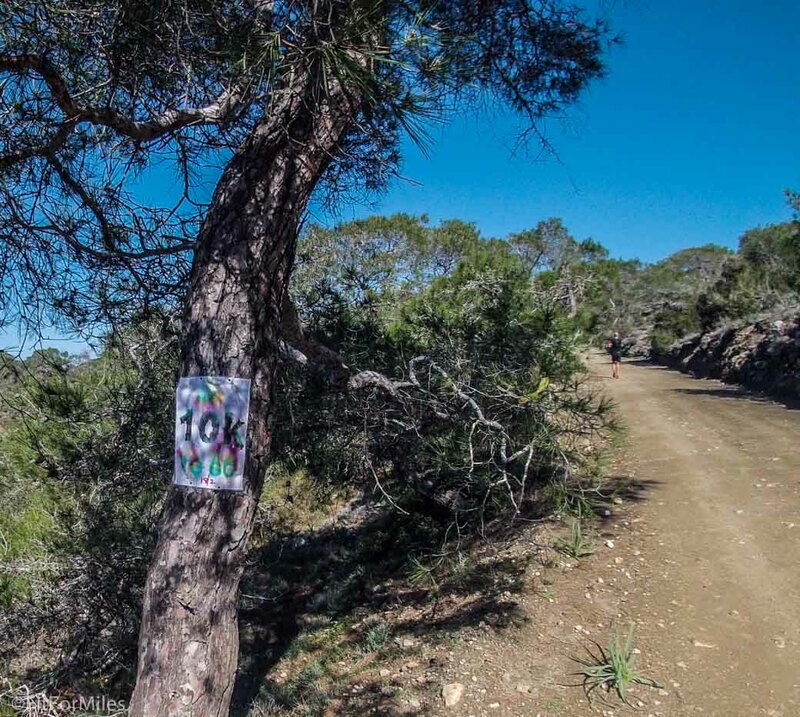 Because of a variety of factors (nice weather, beautiful area of the island, many distance options), the race organizers said this was the most runners they have ever had with over 200 registrations! In fact, they even had to close registration early because there was too much demand. Not a bad problem to have! Our race packet was a bit smaller than that of other races, mainly because this was meant to be a smaller race and thus didn’t have as many sponsors who gave free samples. 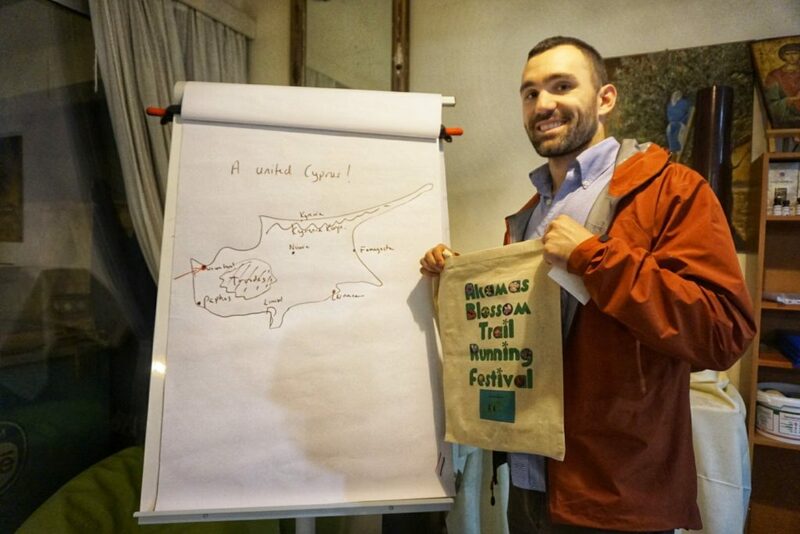 However, we did get these neat canvas bags with the race name on them (50k runners only) and a yummy energy bar made by one of the locals. You Are Here! Posing with my sweet race bag. After getting our bibs and bags, we headed to the restaurant for a light meal. We had a late lunch on the way out there so didn’t need much to hold us over until the next morning, so we got some soup and a couple of beers. Because the race started at a reasonable time – 6am – we didn’t have to rush off to bed right away, which was nice for a change. The race started at a spot just 5 minutes down the road, so it was possible to wake up at 5:15, have breakfast, and still toe the line on time. The alarm went off at 5:15am, and I felt well rested. I had everything laid out from the night before so I slipped into my gear and headed to the lobby where everyone was meeting for coffee before the start. The hotel was nice enough to have breakfast ready for us at 5am (rather than their usual 8am time), which was a huge help. They didn’t have the full fare, but plenty of fruit, coffee, cereal, and cheese for all. It was great! I slurped down a cup of coffee and chowed down a banana before heading to the car. Long shorts, or short legs? 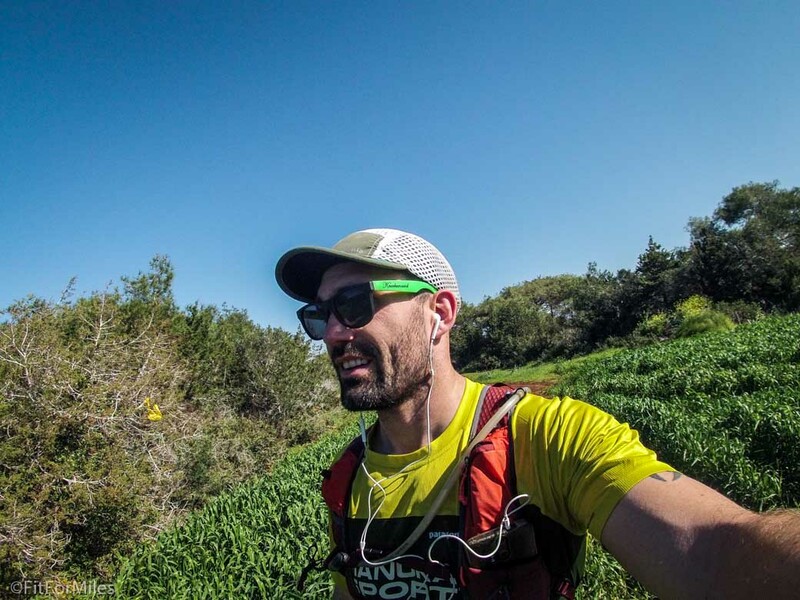 I have been keeping my nutrition very similar to other races and my training wherein I focus on consuming real, whole foods for longer races such as nut butters, meat sticks, and protein bars. 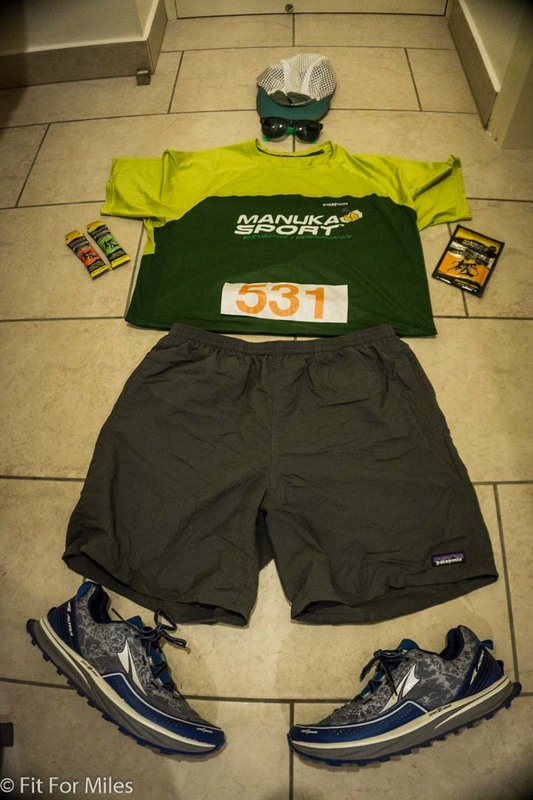 I do, however, supplement these items (which are rather awkward to consume while running) with products from Manuka Sport such as gels and electrolyte powder, as they are a sponsor of mine and provide me with some of my favorite products. I find their gels to be the tastiest, easiest to digest, and most convenient to ingest on the go and I usually add the hydration powder to my water bladder for BCAAs, electrolytes, and a few extra calories. The more I train, the better I am getting at dialing in my nutrition. I used to bring enough food to feed a family of four on runs of 10-20 miles, but now have it pretty squared away to know what I need for various distances. 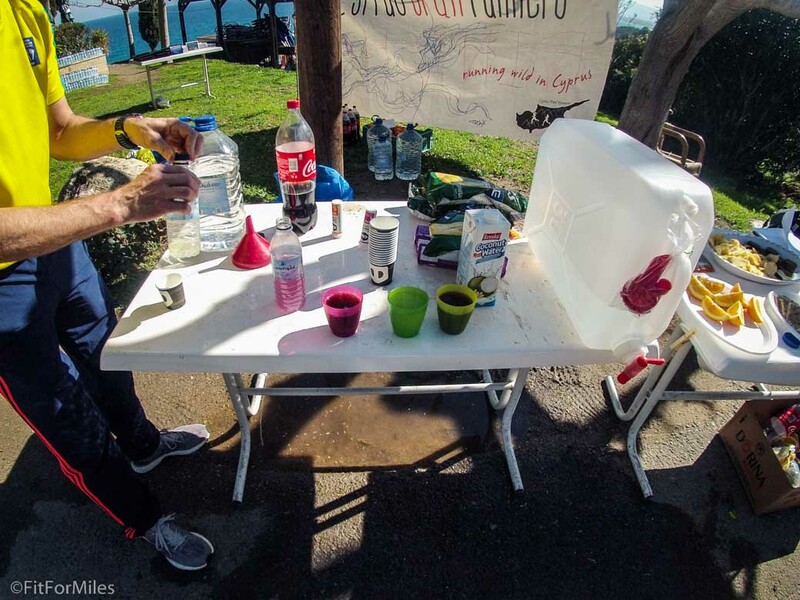 For this race, I knew there would be a couple of “DIY” aid stations with minimal support (mainly just water) but that I could get some good snacks at about the 20 mile mark. So, I packed a couple handfuls of almonds, 3 gels, a meat stick (Nick’s Sticks is still my favorite!) and a protein bar. 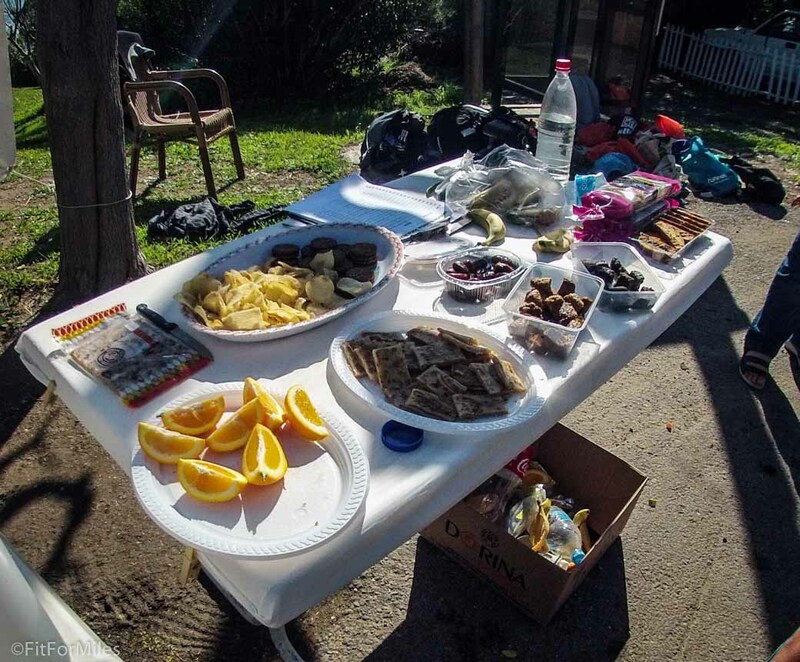 That proved to be sufficient for the entire race with some added calories at the aid stations. 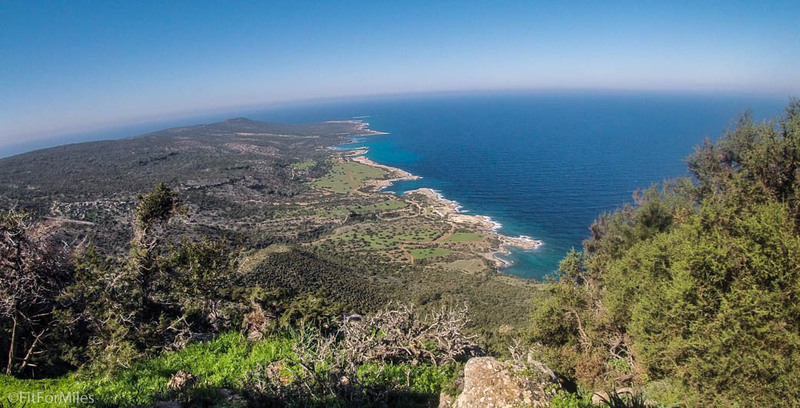 As noted in the race info post, the route for this race traversed the Akamas Peninsula in the north-west part of Cyprus. 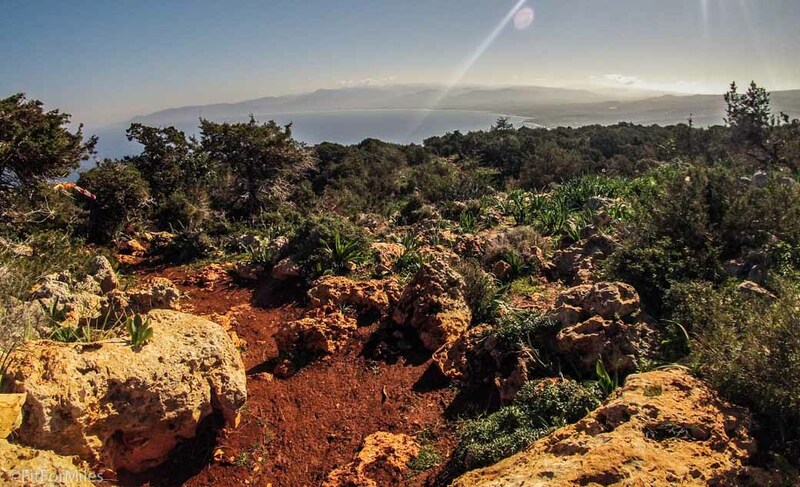 It’s a stunningly beautiful and picturesque area of the island that is relatively untouched yet has a great system of trails and jeep tracks. 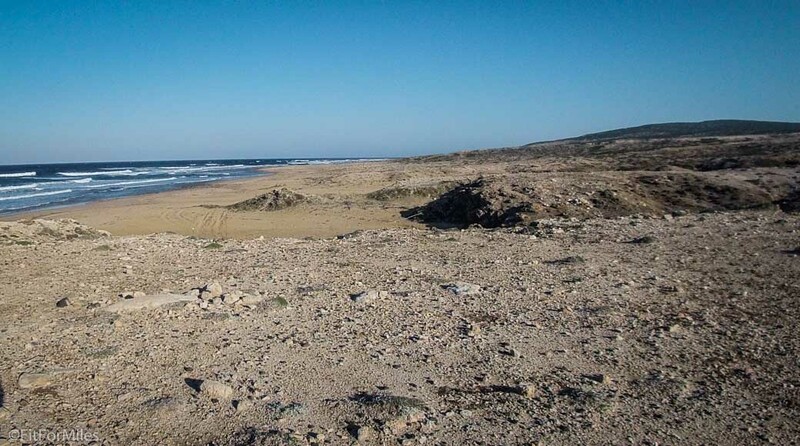 It’s home to a well-known tourist attraction called the “Baths of Aphrodite”, where it is rumored that the Greek Goddess Aphrodite used to bathe in the waters. 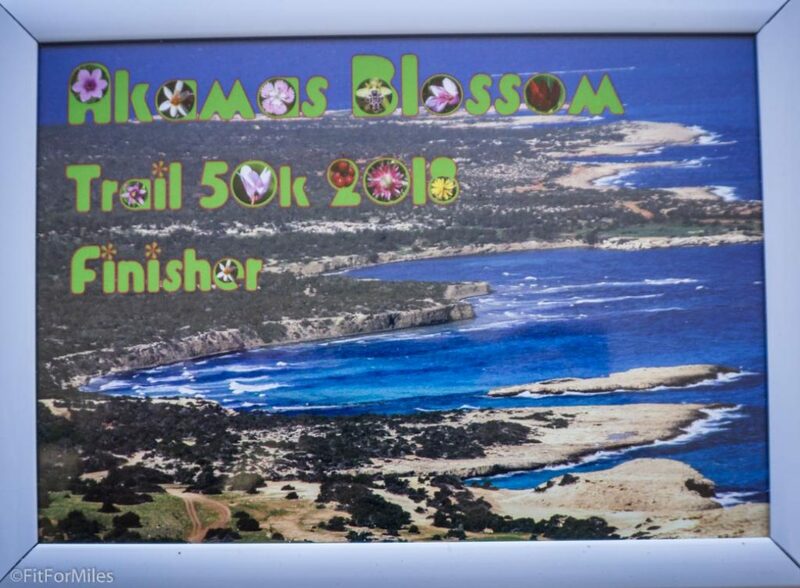 Our race consisted of a 30km loop that started and finished at the Baths of Aphrodite Restaurant and another 21km loop that also started and finished there as well. A few minutes before 6, all the 50k runners gathered in the street outside the restaurant. The race began with a countdown from 10, and all 40 or so of us were off at once. Per usual, I was in the back and started with an easy pace to get warmed up. No sense in rushing it! 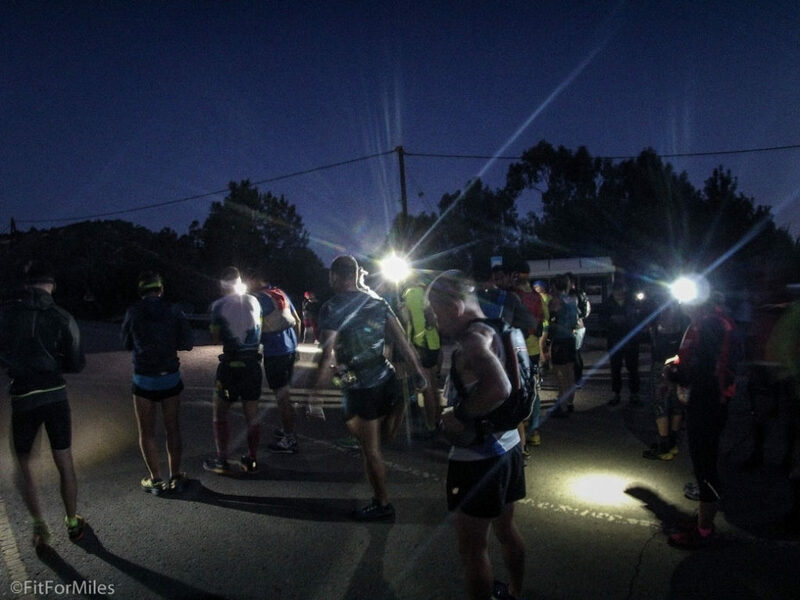 It was just starting to get light as we started, so most people didn’t bring their headlamps. I brought mine for the hell of it, but only had it turned on for a few minutes. 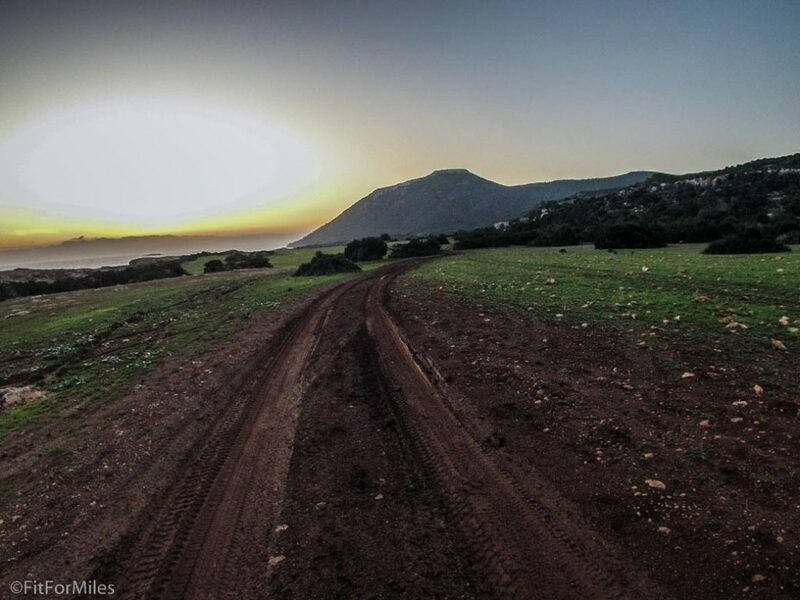 Before long, the sun was peeking up over the hills and brightening the landscape. 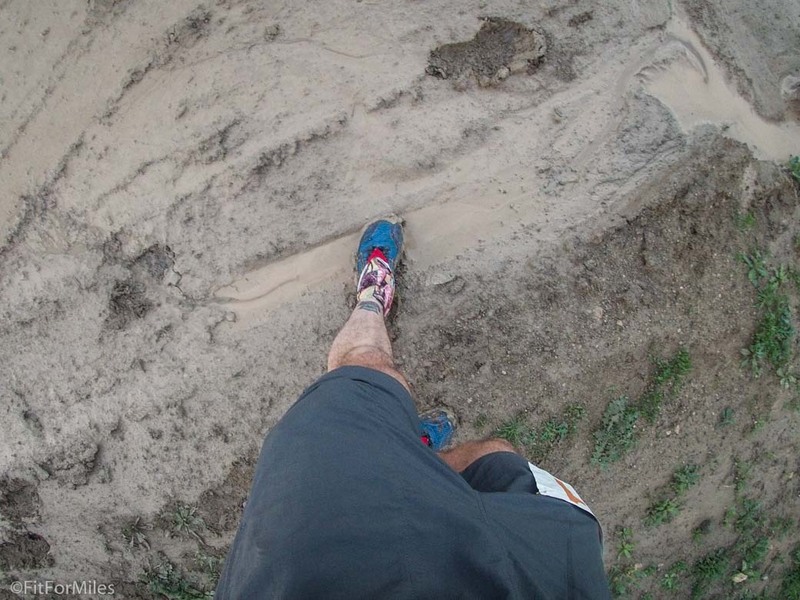 The first couple of miles were along a well-worn jeep track, which was extra muddy thanks to the recent rain. We stayed along this path for a while before popping out right at the coastline. 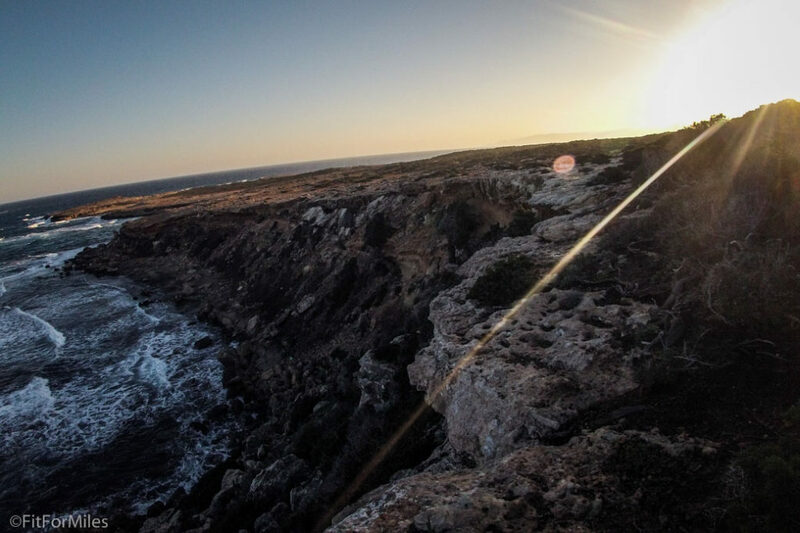 The ocean glowed as the sun continued to rise – it looked incredible! 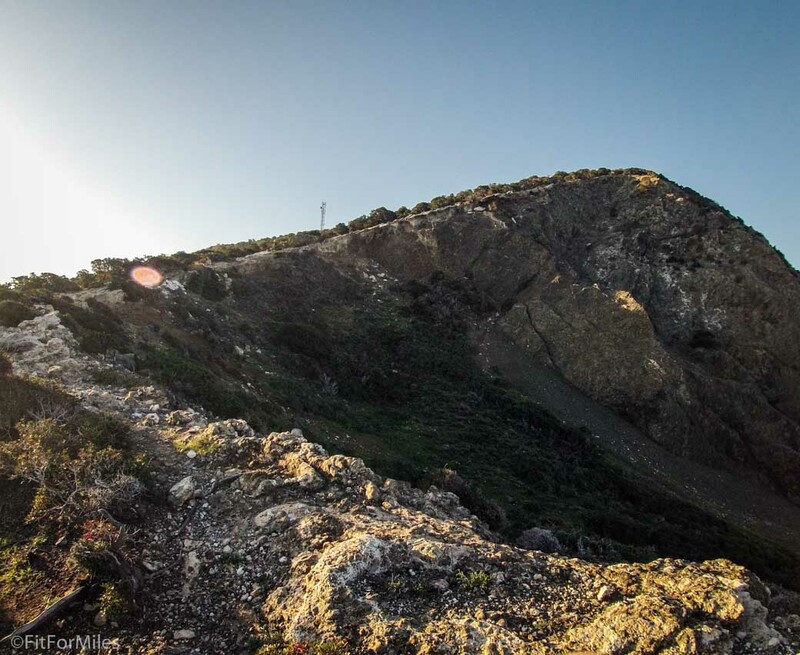 We hugged the coastline for a bit before going across a ridgeline that was right on the edge of a 30+ foot cliff. Better not catch a toe here, or your day is over! 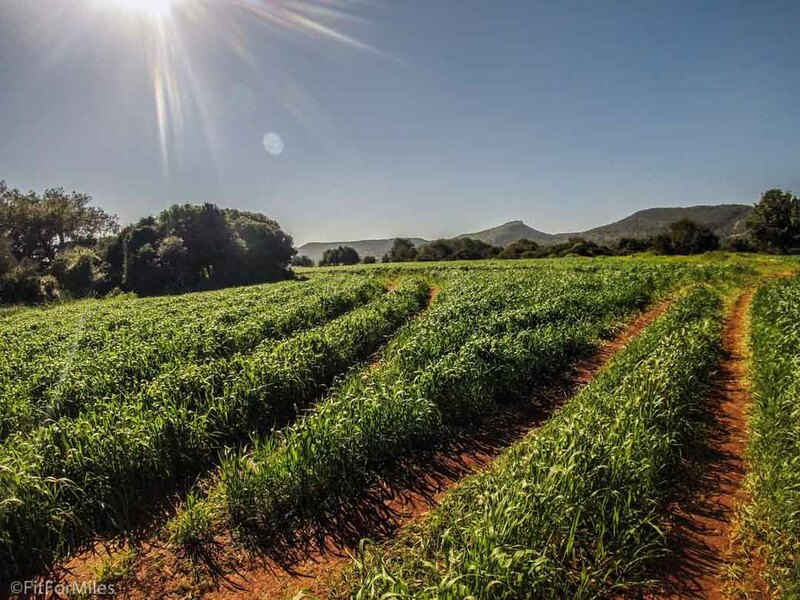 The hill seemed to never end, but maybe it was because of all the bushwhacking! There wasn’t a well-defined trail through this part, so we zig-zagged through the brush to make it to the top. Once on top, I passed the 10k mark. 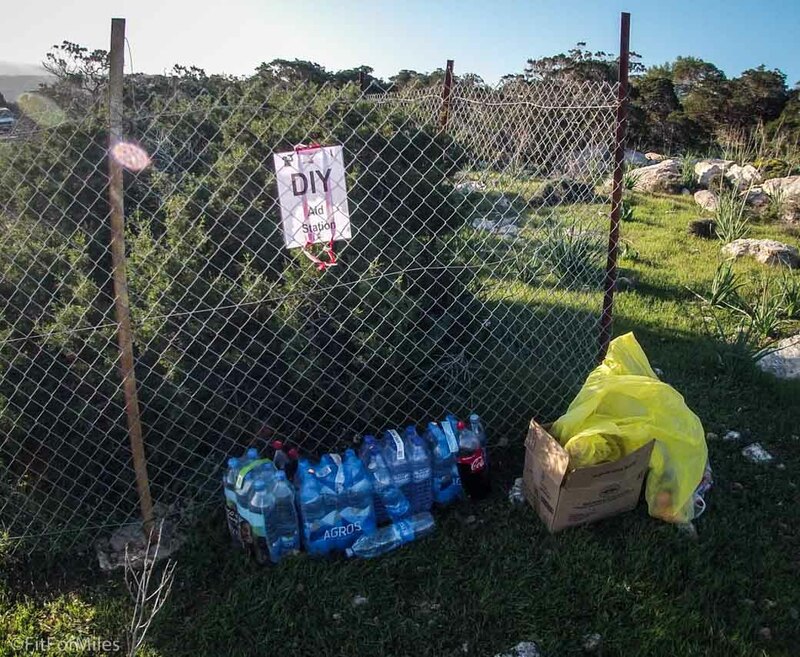 I then came upon the first “DIY” checkpoint, which had Coke, water, and some fruit. I had plenty of supplies left at this point, so I only stopped for the photo before continuing on. From the top of the hill we made our way back down to the coastline again, ending up on the beach and running in the sand. It wasn’t too long before the course kicked us back to another undulating jeep track, which we followed for about 10km. This part was quite serene. Not a ton of breathtaking views, but scenic and quiet. At this point I hadn’t caught up to anyone and had broken away from a couple of folks that were behind me, so I had the whole area to myself without another person in sight. Soon, I came across the second DIY Checkpoint, which had been all but ravished. I still had plenty of food left but needed some water. Luckily there were a couple of bottles remaining, so I fulled up and was back on my way. No bananas left? What gives? Almost immediately after the checkpoint, I passed the halfway point. The rest of this loop was mostly on singletrack trails with precarious footing, so I made sure to keep my speed in check and watch my step. With just a couple of kilometers to go until the 30km checkpoint back at the start, I began passing runners from the 7km race going in the opposite direction. They had started at 10am and our routes were spliced for a time. 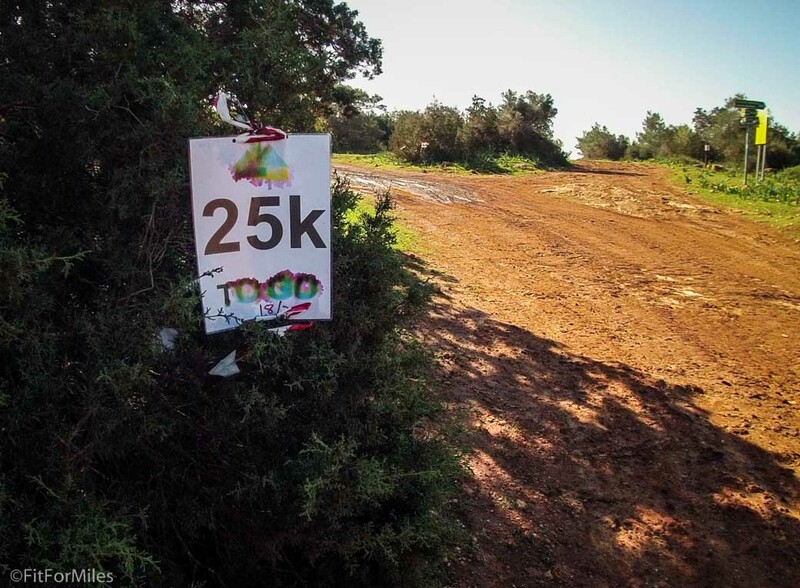 Soon after, I was back at the start line where there was a full aid station. I was still feeling good and took the opportunity to refill my water, grab a few cookies, and chat with the volunteers for a couple minutes. I wasn’t in a big rush and took my time to regroup before heading out. Coke, water, electrolytes. Yes, please! Although I had some extra supplies in my drop bag right across the street, I didn’t bother to get anything out of it. At this point I only had a half marathon remaining and knew I had enough food and water to last. I strapped my pack back on headed back out. The remainder of the race consisted of the 21km (half marathon) loop that was a separate race in and of itself. By the time I started, those runners had already passed through so I found myself alone yet again. Fine with me! Although it was a bit of a climb to get to this section, it was relatively flat for quite a while after, which was very enjoyable. By now the sun was high and it was getting warmer than anticipated. I kicked myself for not packing any sunscreen, but there was nothing I could do about it now! Before too long, I was at the 30km mark and the trail started to go back uphill. It was pretty steep for a while, with one section having some large and swooping switchbacks. I walked that part, obviously! The end of that section was a great view of the valley below. The trail continued on single track, cris-crossing parts we had already run earlier in the loop. It was all starting to look the same by now anyway! I saw the 10k mark and another runner up ahead, whom I eventually passed. 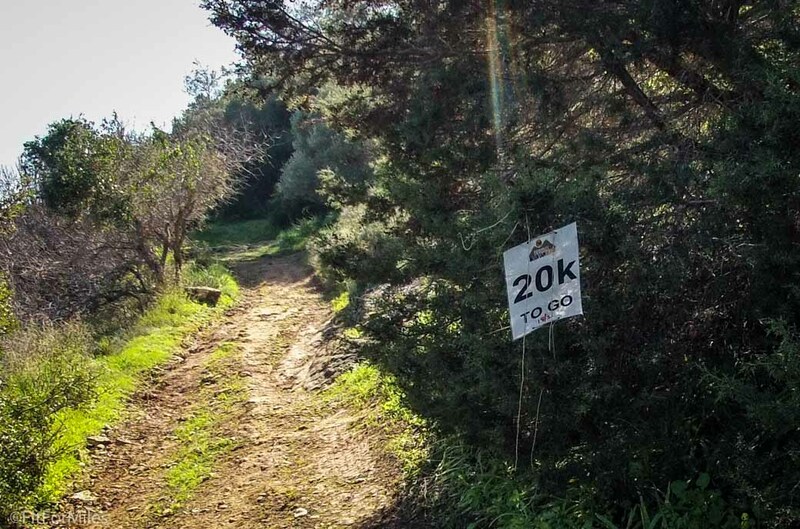 More single and jeep track ahead for the next 5k, until we got to the most picturesque part of the entire route – the Aphrodite Trail! 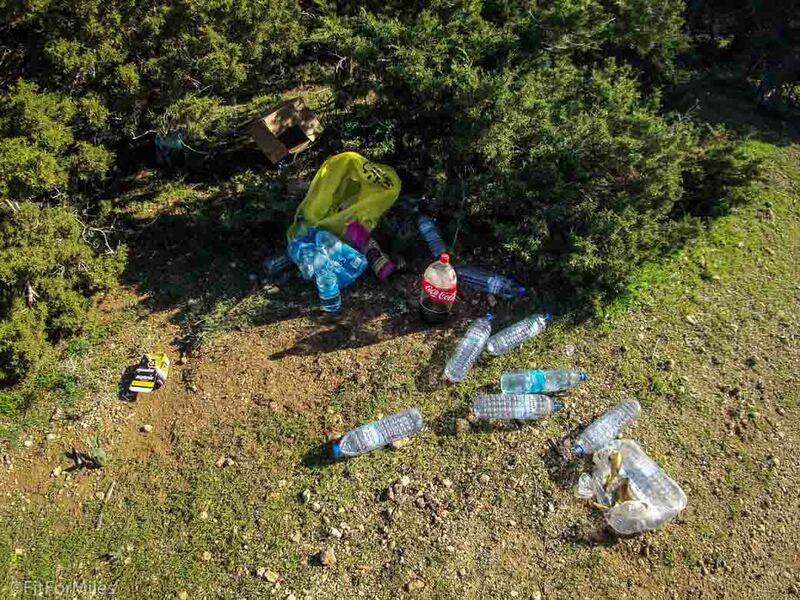 This section, in my opinion, has one of the best views in all of Cyprus and I stopped to drink it in for a moment before carrying on down the narrow path. My feet and knees were aching by this point, so although the view was spectacular I was ready to be at the finish line! The last 5k were mostly downhill on windy singletrack. Because it was getting to be the afternoon, lots of day-hikers were on the trail which clogged things up a bit. They were all very courteous and let me pass. My final time was 7:29 with a distance of 31.6mi/53km. Below is my GPS data from Strava. I came in 33rdth out of 46 runners, which is completely fine with me. As with all my races I’m only out there to enjoy the outdoors and to push myself, both of which I did. This race, while an important part of my schedule, was used more for training purposes than competitive. When I ran my first 50k race last May, I was strict about my training schedule and focused on finishing strong. 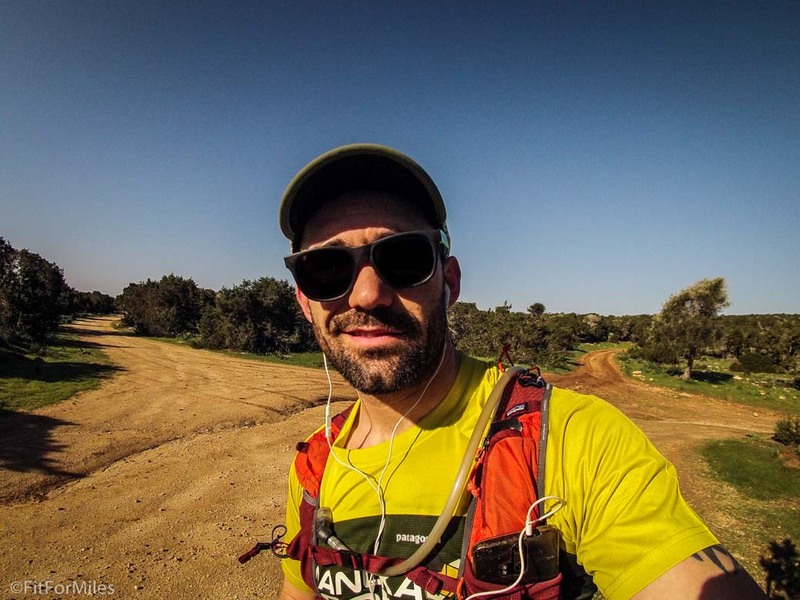 For the Buff Troodos 80k in October, I just wanted to survive. 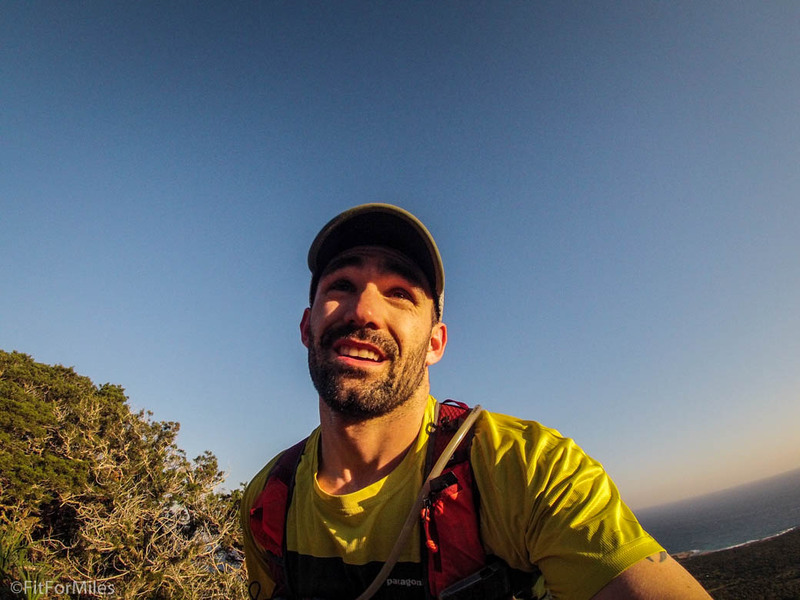 For this race, I wanted to build endurance for my upcoming FKT attempt of the Besparmak Trail as well as my thru-hike of the Appalachian Trail. 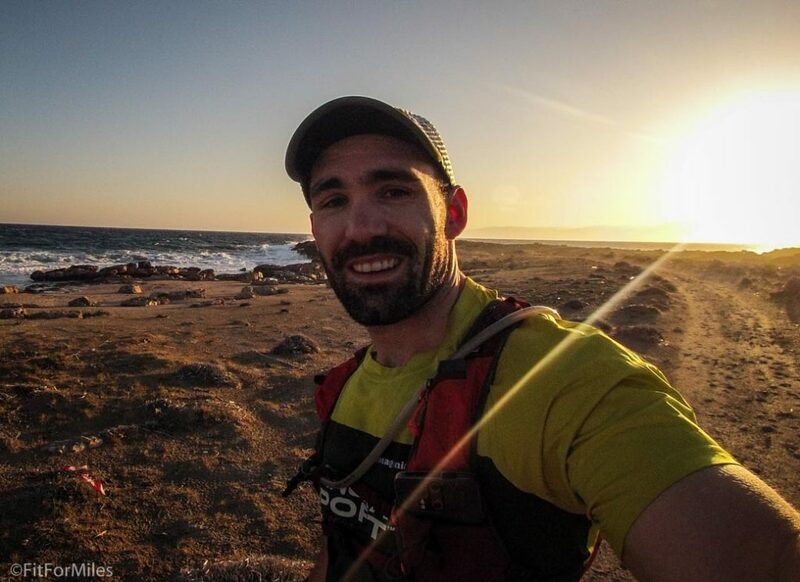 As such, the goal was not to be competitive but rather to log miles, get some good “time on feet”, and enjoy the wonderful people and scenery. I was much more interested in injury prevention than I was racing, and my timing showed it. I have not been performing any speed work whatsoever, just logging long runs and a leisurely pace while exploring the mountains. Although I was a bit startled by level of competition and the sheer talent on the course that day, I’m just thankful to have been a part of yet another wonderful race. As for mistakes, I didn’t make any major ones that I can think of. This distance is the most manageable of all Ultras, and by staying hydrated and consuming enough calories I was able to push through without feeling annihilated. My feet were trashed, per usual, and I was certainly ready for a nap, but otherwise I felt alright. That’s a good indication that I’m nearly ready, at least cardiovascularly, for the AT. This race was a great opportunity to squeeze in an Ultra before switching to thru-hiker mode. 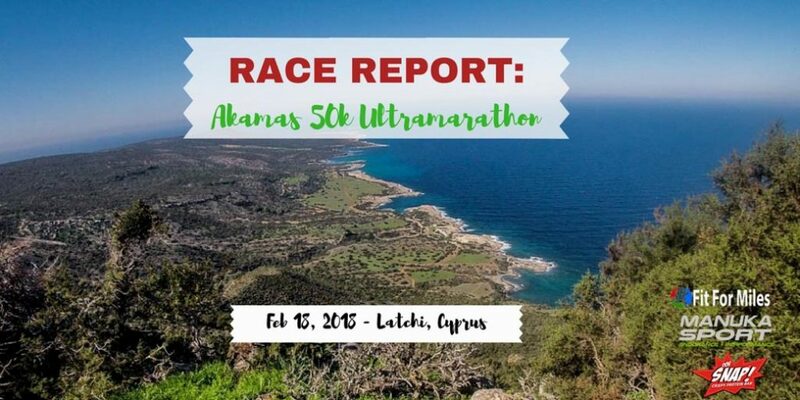 Training for this race was a great way to keep up my strength and endurance during the winter months, and spending a weekend in the Akamas was amazing. The course was great, the organization and marking was superb, and it was all-around one of my favorite races ever. 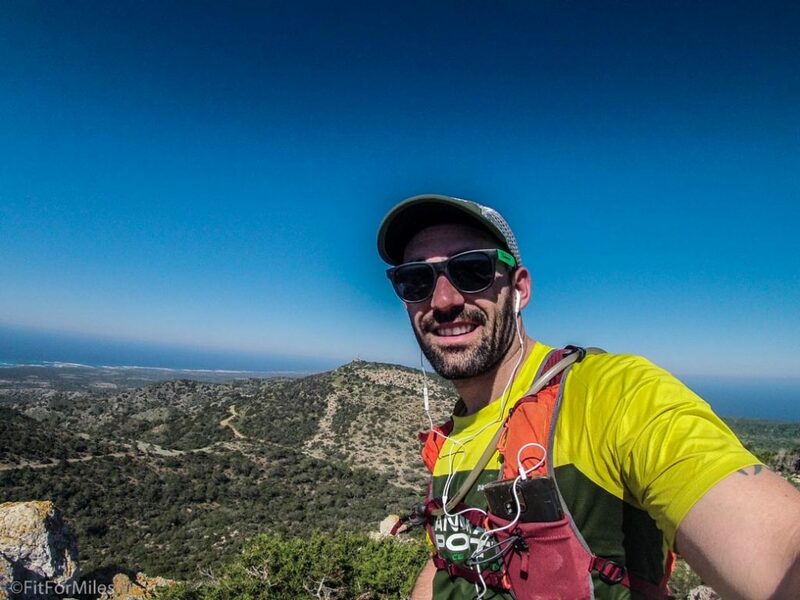 Unfortunately this will be my last ultra for quite some time, and my last one in Cyprus for the foreseeable future as I depart next month with no plans to return. Now that the Ultra is done, I’m completely switching my mindset and training to focus on hiking. 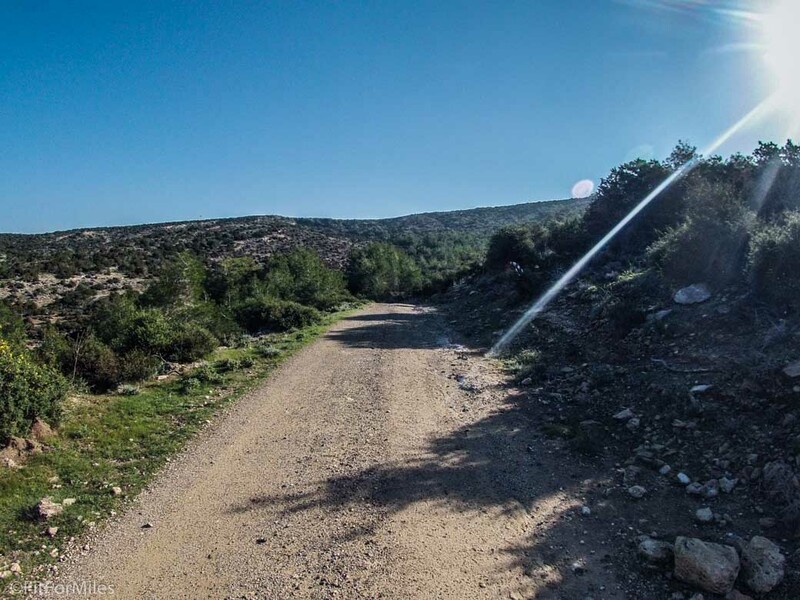 In just over a week, I will attempt an FKT of the Besparmak Trail, a 255km route through the mountains of Northern Cyprus, as training for my Appalachian Trail thru-hike beginning on March 25th. Stay tuned for more on those activities. Very useful write up. I was also running that day (but on the 21km). 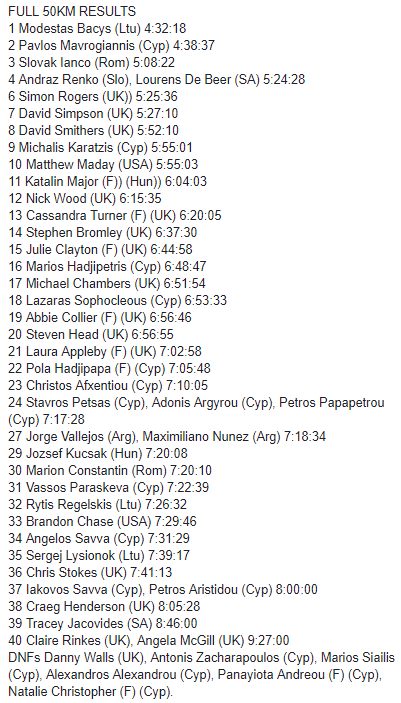 Im signed up for my first 50km in May (also in Cyprus). I’ll be sure to pack some sunscreen! Thanks, Adam! Very glad you found it useful. This was one of my most favorite races and I loved the course! 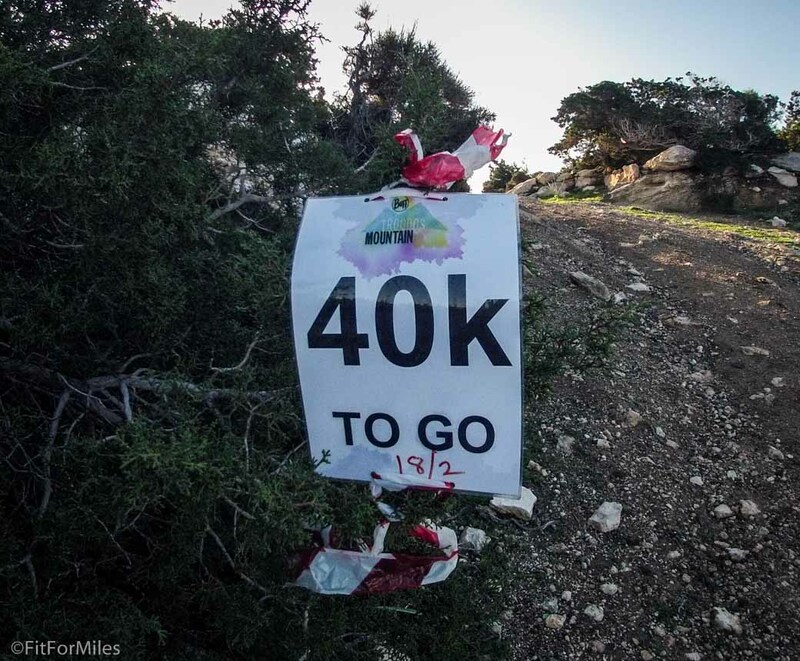 Are you doing the Cyprus Ultra in May? Definitely pack some sunscreen and electrolytes, it’ll be a hot one! Brandon, thanks a lot for the post. Really thank you! Much obliged.